Seasons 52 just released their new fall menu. They invited us out to give it a try and being the fans of fall flavors that we are we couldn’t resist getting a chance to dive into the new menu. 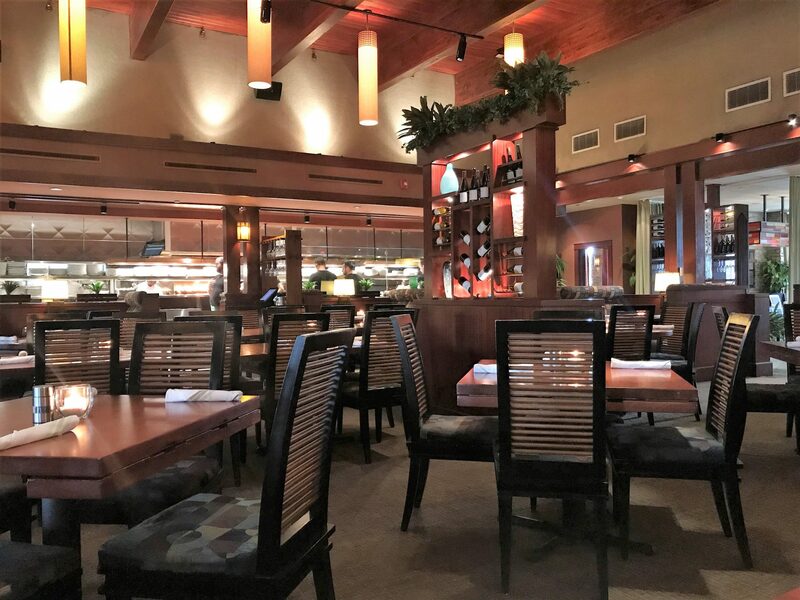 We’ve never been big fans of eating at chain restaurants but Seasons 52 has a way of conveying an authentic feel that we really appreciate. Their menu changes seasonally to fit the current season. They offer a number of healthy options that are actually delicious. And most importantly they’re managed by a partner who treats the restaurant as his own. We kicked things off with The Pearfect Storm. 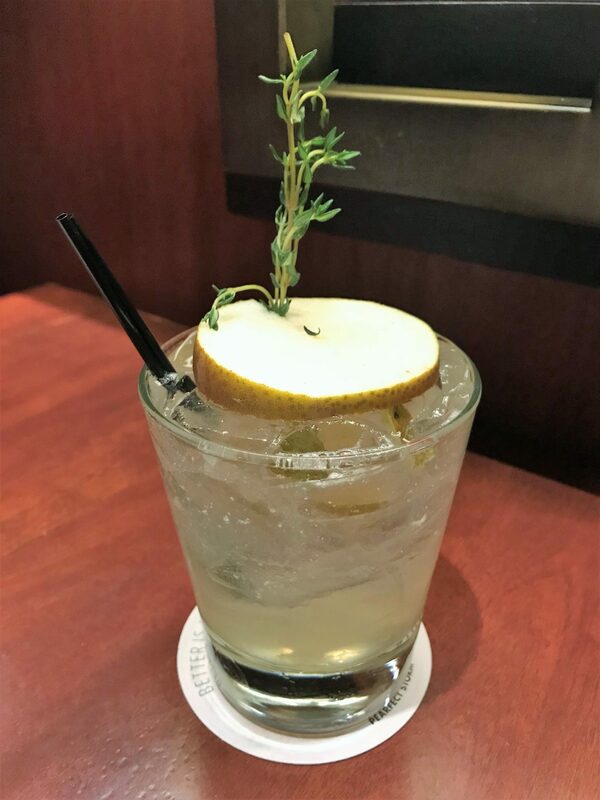 This cocktail is made of Absolut Pear Vodka, St- Germain Elderflower Liqueur, Bosc Pear, and thyme. I ordered it because I love Elderflower Liqueur and there was a hurricane bearing down on the Florida panhandle at the time of my visit. I expected a subtle, almost watered down cocktail because pear tends to be understated, but it was full bodied and packed a pleasant punch. Seasons 52’s new harvest menu offers up 3 courses for $29.95. Given that some of the menu options cost near that price all by themself when ordered from the regular menu this new pre fixe menu is a pretty darn good deal. All of the selections we review in this article are available on the 3 course pre fixe menu. 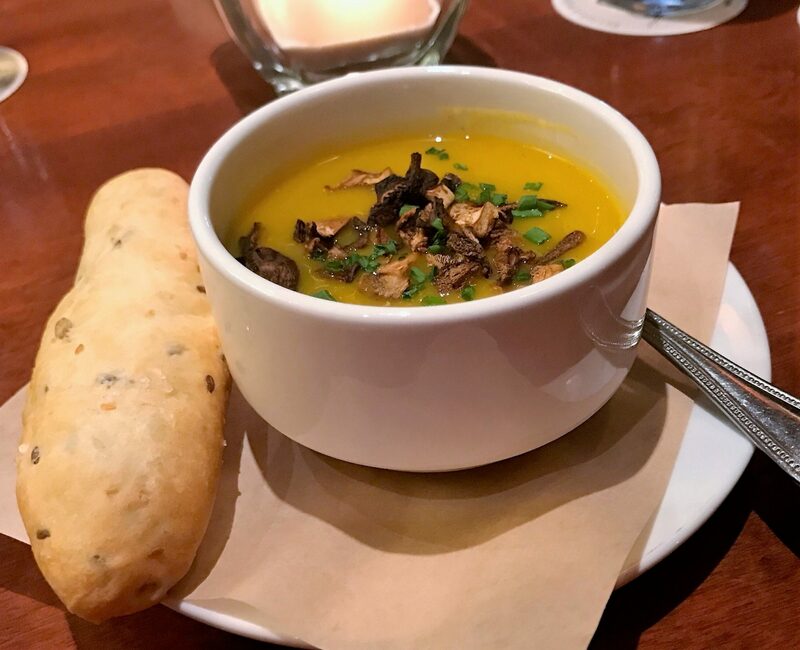 First, we tried the butternut squash soup and the porcini mushroom bisque. My experience with bisque is that it is creamy, but this one was more earthy and did not have the cream I expected. The flavor however was incredible. It was rich and deep and had this melt in your mouth umami thing going. 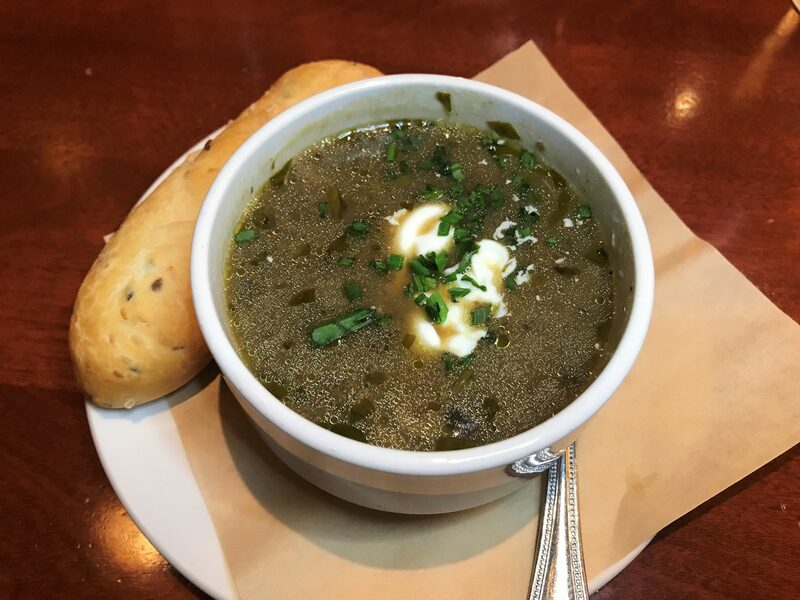 I would go back to Seasons 52 just for the mushroom bisque, as long as it is in season. You do have to like mushrooms to enjoy this soup, as there are tons in the warm broth. This is one of the better soups I have ever eaten and probably the best mushroom bisque of my life, even though the presentation of a more brothy soup with mushrooms wasn’t what I envisioned. The breadstick that came with both soups was warm and salty, a perfect partner for soup. The butternut squash soup was a nice version of a soup we’ve all had before. The flavor was mostly predictable but with a tiny bit of spice on the back end of each bite. It was topped with dried shiitake mushrooms which added nicely to the flavor but had a spongy texture that really took away from the enjoyment of the soup. If you’re in the mood for a butternut squash soup you’ll be happy you ordered it. If you’re not in a particular mood definitely go for the porcini mushroom bisque as it really is divine! 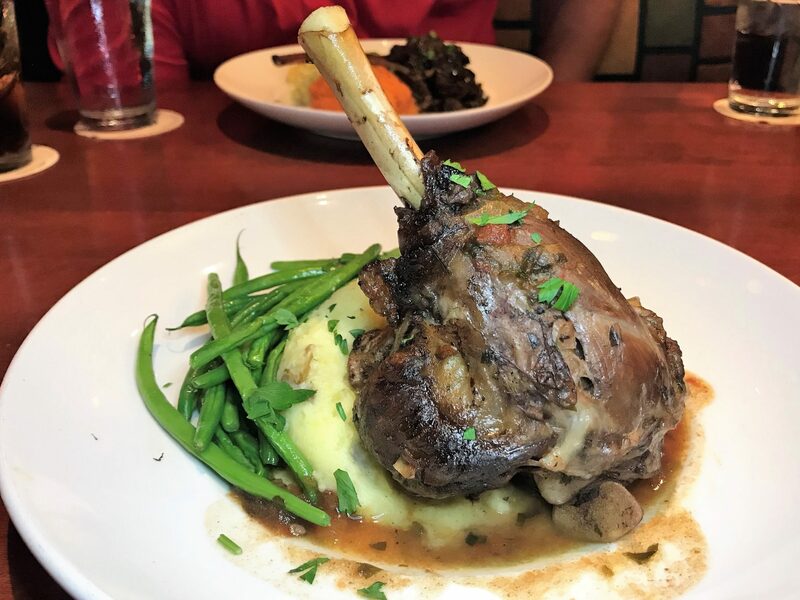 For entrees we tried the Mediterranean-style Australian Lamb Shank with sautéed green beans and Yukon mashed potatoes and Venison Chop with venison ragout, caulini, and sweet potato mash. The lamb shank is a heavy, meaty choice, and the fresh green beans contrast with it beautifully. The jus is possibly made of angels tears it’s so good, and really brings the whole dish together. This meat and potatoes entree is for the person who wants to get their fill and have it stick to their ribs when they’re done. It’s a remarkable value on the harvest pre fixe menu. Venison chop was simply fabulous and the vegetables it was served with were the perfect complement for it’s flavor. This was a hearty dish really brought home by the venison ragout served over and around the chop. A bite without the ragout felt lighter, a bit like diving into a nice steak. A bite with the ragout was a bite of meaty indulgence fit for a king. The caulini (a cross between broccolini and cauliflower) was nice and crisp. It’s not a strong tasting vegetable, but the texture is a real cross between broccolini and cauliflower. The sweet potato mash was wonderful, a treat on the plate. For dessert we sampled the dessert style that Seasons 52 is known for, the mini indulgence. 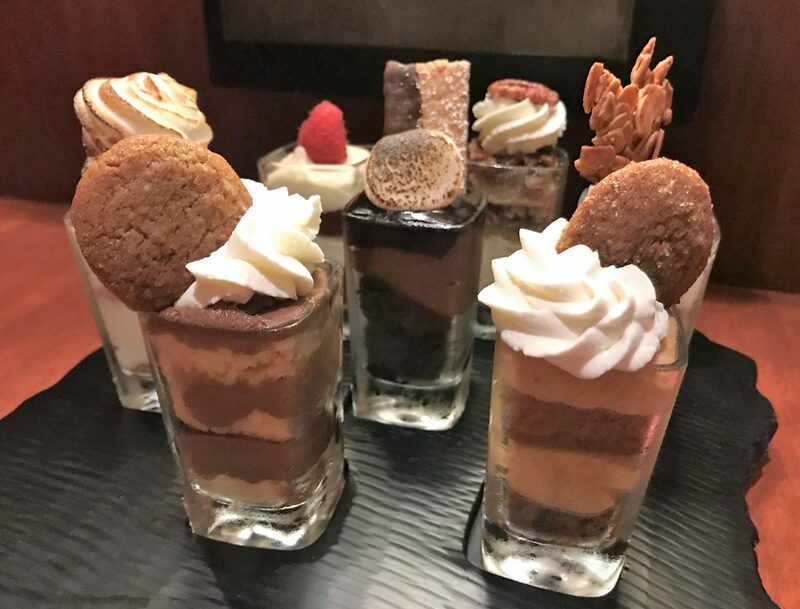 The mini indulgence is a slightly bigger than shot glass filled dessert that runs the gamut from s’mores to chocolate overload to peanut butter flavors to everything in between. It’s not to be missed. 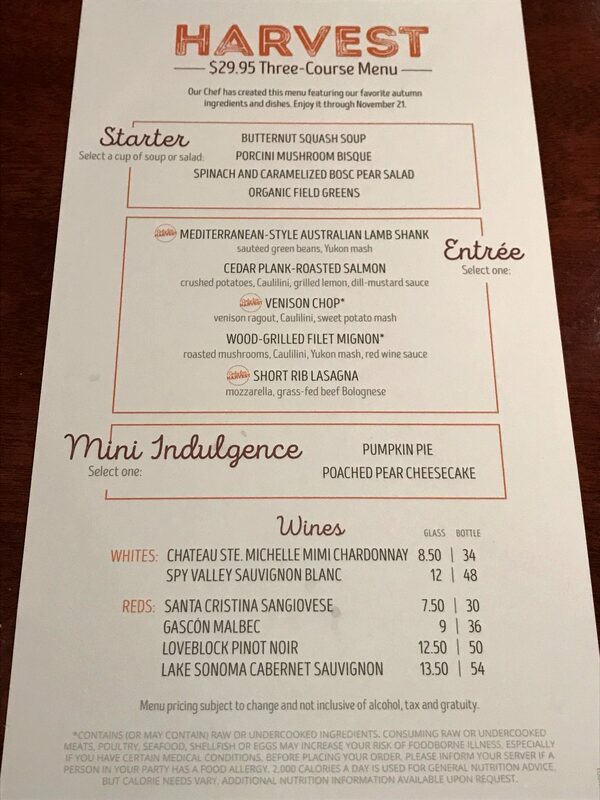 You can actually choose any of the mini indulgences with the pre fixe harvest menu, but the two seasonal options are pumpkin pie and poached pear cheesecake. The pumpkin pie is pumpkin mousse layered with pumpkin cake, topped with whipped cream and a housemade cookie. It’s a little lighter than your typical pumpkin pie as far as texture, but every bit as rich with the sweet pumpkin flavors in each bite. The poached pear cheesecake was a creamy delicious cheesecake layered with poached pears, topped with whipped cream and the same housemade cookie used in the pumpkin pie. This was quality cheesecake with just a hint of pear. For cheesecake lovers you can’t go wrong with this one. We’d be remiss if we didn’t mention the service at the St Johns Town Center location of Seasons 52. Every single we time we visit the service is stellar. This visit was no exception. The server knew every little detail of each dish and was fabulous at helping us to find a dish that met our heart’s desire. He made sure every detail was taken care of, made recommendations when we asked, and took care to ask how we were enjoying each course along the way without being overbearing. Seasons 52’s fall menu is packed with hearty dishes that will delight your palate and warm your heart. 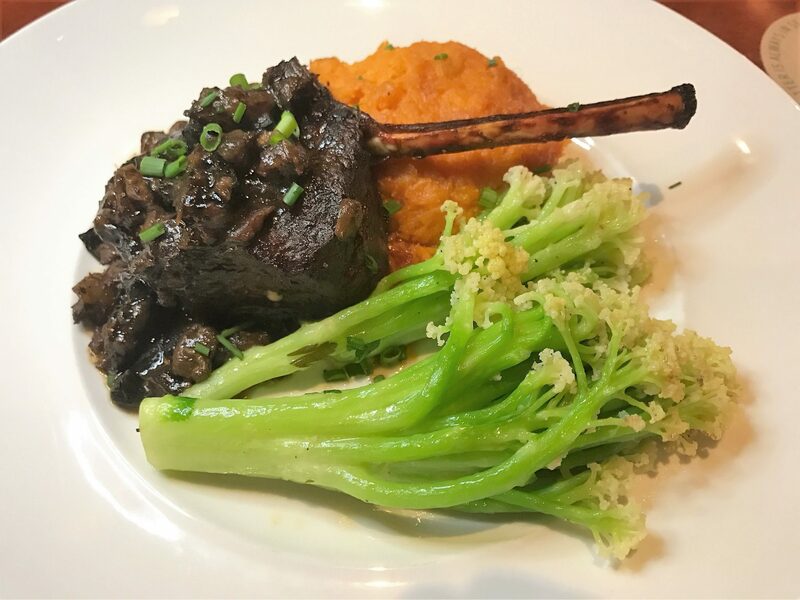 There are options for when you want to eat something familiar like the wood-grilled filet mignon or when you want to dine adventurously such as the venison chop or the Australian lamb shank. We’re confident that if you decide to dine with Seasons 52 you’ll have a great experience from beginning to end. Dive into a mini indulgence for us if you stop in would ya? Tagged Beer and Wine, cocktails, Date Night, fall, fine dining, game, Healthy, healthy options, meat, pre fixe, Soup. Bookmark the permalink.